Composed by Qian Chen. Conservatory Editions. Score and parts. Neil A. Kjos Music Company #WB420. Published by Neil A. Kjos Music Company (KJ.WB420). 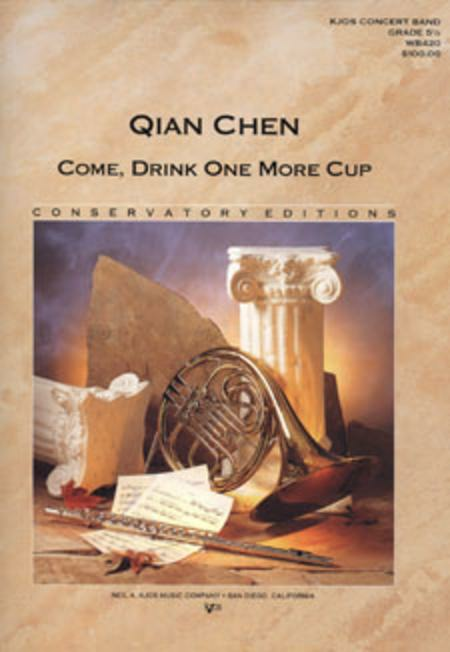 A remarkable and unique selection by one of China's best-known wind ensemble composers, Come, Drink One More Cup is inspired by a classical poem about the pain of parting. Employing a musical language that deftly mixes the traditional sounds of Chinese music - including a number of Chinese percussion instruments - with modern compositional technique, the piece will transport audiences to a different land. Filled with stunningly beautiful pentatonic melodies and vast, open vistas of musical space, Mr. Chen's creation offers something for everyone.